Bear Case (75%): SPX sells off early this coming week and penetrates 2000 and closes significantly below it (1% or more). That would signal an excellent chance of more selling to test 200 D-SMA (SPX 1980) and PUL's (around SPX 1900). 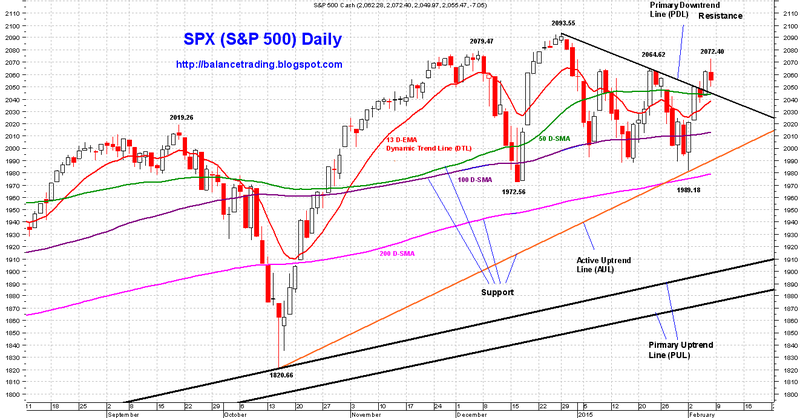 Bull Case (25%): SPX back tests its 50 D-SMA and PDL before rallying to put in a new all time high. A daily close above 2065 would be a signal to me to cover short positions. A daily close below 2000 would be a signal to add more short positions. I've been a full time trader since 1997 when I quit my aerospace engineering job. I clearly remember the period from October 1999 to March 2000. What's happening now is very similar to what was happening then. Indices (especially NDX) rallied strongly from mid Oct 1999 to Dec 31 1999, they sold off in Jan 2000, rallied back strongly in the first trading week of Feb 2000, the sold off again for the remaining three weeks of Feb 2000 before strongly rallying to put in all time highs by late March of 2000 (NAZ 5000). I wonder if the same thing is happening. SPX rallied dramatically from Oct 20, 2014 to its all time high on Dec 29, 2014. Then it sold for in Jan 2015 and rallied the first week of Feb 2015. If SPX is going to continue to follow its early 2000 pattern, it should sell off from now until late Feb to early Mar 2015.